I am a full-blown sports junkie, which means I spend WAY too much time looking at sports sites: ESPN, Sports Illustrated, and of course, Grantland. About a month ago, I was feeding my sports addiction when I noticed Grantland was completely redesigned. Other people have already analyzed this redesign from a business and visual perspective, but no one has tackled the redesign’s SEO ramifications… until now. In this post, I will provide a comprehensive technical SEO audit for Grantland. This example is extremely detailed, and it covers a wide range of SEO topics (e.g., in-depth article listings, Google News, structured data, duplicate content, backlink analysis, etc.). Grantland is a sports and pop culture site that was launched in June 2011 by Bill Simmons. Features – This section contains long-form articles about various sports and pop-culture topics. The Triangle – This section covers different aspects of sports (e.g., news, “hot takes”, gambling, etc.). Hollywood Prospectus – This section is all about pop culture (e.g., TV, movies, music, etc.). Grantland also has landing pages for podcasts and videos, but the raw media files are hosted externally. 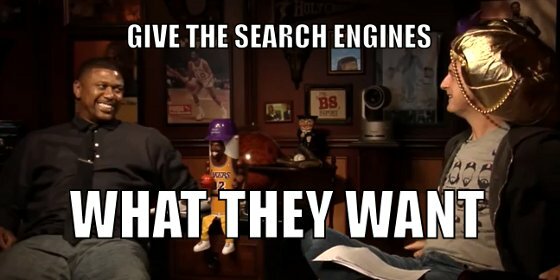 Every site should strive to give the people what they want, but in this audit, I’m also helping Grantland give the search engines… what they want! Before I jump into the technical details of the audit, it’s important to note that Web Gnomes and I have no affiliation with Grantland. As a result, I don’t have access to any of the site’s analytics or webmaster tools accounts, and I don’t have access to the site’s content management system (CMS). When analyzing a site, it’s important to characterize the site’s organic search performance. Specifically, you want to identify how the site’s organic search traffic is evolving over time. Also, you want to look for any warning signs that indicate the site might have been impacted by an algorithmic update. As the graph shows, the site’s visibility increased dramatically after August 4, 2013. This date is important because it also corresponds to when Google started displaying in-depth articles in the search results. To determine if Grantland’s articles appeared in those new search results, I used MozCast‘s in-depth article data set (supplied by Dr. Pete). Based on that data, Grantland URLs initially appeared for 2.1% of the keywords that generated in-depth article results. Although 2.1% seems like a small number, some of these in-depth keywords generate hundreds of thousands of searches each month (e.g., “kobe bryant”, “lebron james”, etc.). Therefore, it appears that in-depth articles were largely responsible for Grantland’s visibility boost in August. The SEO Visibility graph also reveals two distinct periods of declining visibility. The first decline occurred after November 10, 2013, and it continued until the site rebounded slightly after December 1, 2013. The second decline started after January 12, 2014, and it intensified significantly after January 26, 2014. As of right now, the site’s visibility is at a 6-month low. According to the MozCast data set, Google increased the number of keywords that triggered in-depth article results around November 13, 2013. On December 5, 2013, Google announced an extended number of in-depth article listings. According to the MozCast data set, Google decreased the number of triggering keywords around January 31, 2014. Grantland’s visibility fluctuated almost in lockstep with these changes. After the first change, Grantland URLs only appeared in 1.4% of the MozCast keywords that generated in-depth article results, and the site’s visibility dropped. After the second change, some of the Grantland URLs appeared in the extended in-depth article listings, and the site’s visibility rebounded slightly. 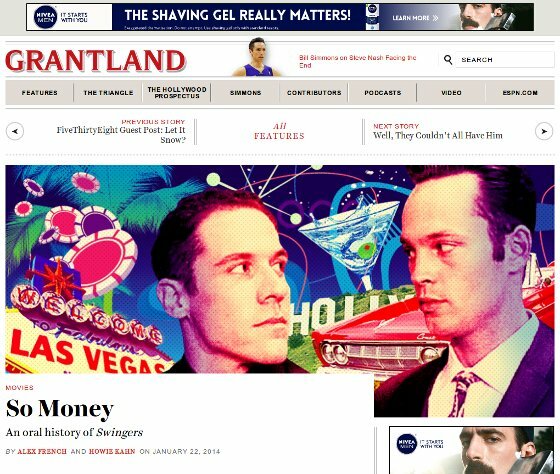 Since Grantland’s redesign went live right before the most recent decline in January, it is probably responsible for the lost in-depth article listings and the reduced organic search visibility. Clearly, the site could benefit from a comprehensive SEO audit. For the remainder of this post, I will evaluate Grantland’s conformance with SEO best practices and identify the site’s most pressing SEO problems. For each of those problems, I will also offer recommended solutions. To determine how many of Grantland’s pages are crawlable, I crawled the entire site using my own proprietary crawler and Screaming Frog’s SEO Spider. Both crawlers found a few hundred URLs that were unique to each site crawl, and after merging the two site crawls, I successfully crawled 14,871 unique Grantland pages. However, just because these pages are crawlable does not mean they’re accessible to search engines. A site’s accessibility is defined by many other factors, including search engine-specific restrictions, the site architecture, and performance metrics. The first two records in the file specify the locations for Grantland’s XML Sitemaps (more on those in a moment). The next record politely asks IRLbot (a crawler used by an academic research project) to wait an hour (3,600 seconds) between visits. This consolidation isn’t mandatory because the existing file is syntactically correct; however, a single record is easier to process for search engines, and it is easier to maintain for humans. Regardless, none of the file’s disallow directives restrict access to Grantland’s most important pages. All of Grantland’s pages include a robots meta tag that uses the default value (“index, follow”). These tags don’t restrict access to search engines; however, they are unnecessary because a missing tag has the same effect as a tag with the default value. The first listing points to the site’s Web Sitemap, which should include URLs for every page the site wants search engines to crawl and index. The second listing points to the site’s News Sitemap, which should include URLs for news articles that have been published on the site within the past two days. This Sitemap correctly implements the Sitemap protocol (i.e., it is syntactically correct), but it only lists 7 poorly chosen URLs. Specifically, the homepage is listed twice (with and without a trailing slash), and 3 of the other URLs (/masthead/, /404-page/, and /e-mail-the-sports-guy/) shouldn’t be indexed, due to thin content. I recommend compiling a comprehensive list of the site’s index-worthy pages (i.e., pages that are substantive enough to warrant inclusion in a search engine’s index) and creating the Sitemap using that list. Since Grantland’s News Sitemap is empty, Google News only displays the site’s pages that have URLs containing at least 3 digits (as specified in the technical guidelines for inclusion in Google News). To avoid this restriction, I recommend consistently updating the Sitemap to include news articles that have been published on the site within the past two days. To evaluate how efficiently authority flows through the site, I performed a PageRank-based analysis on the site’s internal link graph. As the distribution shows, the site’s authority flow is very inefficient. 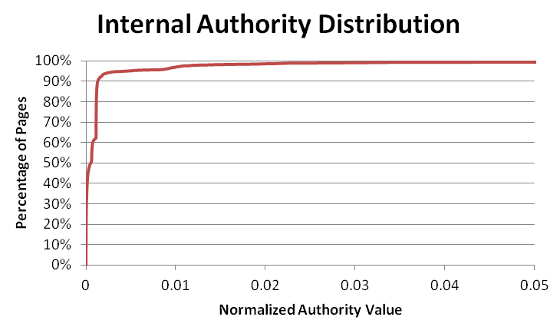 On one extreme, 99.3% of the pages have a normalized value less than 0.05 (pages with authority values closer to 0 have the least authority, relative to the other pages). On the other extreme, less than 0.5% of the pages have normalized values larger than 0.95. Stated more clearly: 82% of the site’s internal authority is held by only 0.7% of the pages. The root cause for this authority imbalance is the site’s navigation structure. All of the pages that receive large amounts of internal authority are located in the site’s header or footer. Of the site’s 10 most authoritative pages, 7 are found directly in the header’s top navigation menu, and the other 3 are found in one of the header’s mega menus. Since all of these navigation elements appear sitewide (i.e., on every page), the pages listed in those elements receive internal links from every page on the site, while the pages outside of those elements receive virtually no internal links. Some of Grantland’s pages use widgets to promote more of the site’s content; however, those widgets almost always display the same articles that are featured in one of the header’s mega menus (or articles from the same time period). Consequently, the widgets do not effectively expand the pool of pages that are receiving internal authority. To correct the site’s authority imbalance, I recommend reorganizing the navigation structure to reduce the number of pages receiving sitewide navigation links (and reduce the sitewide authority dilution those links are creating). I also recommend creating more cross-page linking opportunities so that the internal links are more evenly distributed throughout the site (and the internal authority is no longer monopolized by a small fraction of the pages). While analyzing Grantland’s internal authority flow, I identified a number of suboptimal links in the site’s link graph. Specifically, 34,679 of the site’s internal links return a 301 or 302 HTTP status code (i.e., they redirect to another location), and 13,499 of those links return more than one 301 or 302 HTTP status code (i.e., the redirection chain has multiple destinations). All of this redirection unnecessarily wastes valuable internal authority, and as a result, I recommend updating each of these links to point to the final destination of its redirection chain. Additionally, I recommend using 301 HTTP redirects exclusively because they leak less authority than 302 HTTP redirects (this suggestion should only apply to external redirects once the internal redirects are removed). During the same link graph analysis, I also identified 758 internal links that return 404 HTTP status codes. These broken links unnecessarily waste the site’s crawl budget, and they harm the site’s user experience. I recommend removing these broken links or updating them to point to appropriate live destinations. Another important characteristic of the site architecture is the number of clicks it takes to get from the homepage to every other page on the site (i.e., the click depth of each page). If pages are too far from the homepage, they are much less likely to be crawled by search engines (or found by users). 41% of the site’s pages have a click depth greater than 5 (i.e., they are more than 5 clicks away from the homepage), and 10% of the site’s pages have a click depth of 10 or more. Shockingly, 12 pages are 80 or more clicks away from the homepage. To reduce the click depth for many of the site’s pages, I recommend creating new ways to interlink the site’s pages. For example, each article could use a widget that displays topically similar articles, based on a metric other than date (e.g., internal links, social shares, etc.). Similar approaches could dramatically improve the site’s click depth distribution by regulating how quickly (and how far) pages move away from the homepage. Site speed is important because search engines explicitly factor that information into their rankings. Additionally, since search engine crawlers have a limited crawl budget, they crawl quicker sites more thoroughly and more regularly than slower sites. Grantland’s site speed is decent, but it has room for improvement. The homepage’s Time to First Byte (TTFB) is only around 100 ms, but it takes about 6 seconds to load the entire page. The homepage also receives low Google Page Speed scores: 47/100 for Mobile and 65/100 for Desktop. The site’s internal pages have similar performance problems. Some of the pages load slightly faster than the homepage (primarily because they are smaller), but the entire site would still benefit from the aforementioned performance best practices. In addition to suboptimal load times, many of the site’s pages have references to inaccessible objects (i.e., objects that return 4xx HTTP status codes). I recommend fixing these broken references because they unnecessarily waste both processing and network resources. In the previous section, I evaluated Grantland’s accessibility to determine if search engines are able to access the site’s content. Now, it’s time to identify how much of the site’s content is actually being indexed. According to this estimated index count, Google has indexed almost twice as many pages as a crawler is able to access. Although this index count is notoriously inaccurate, it still suggests that the site has indexing issues (e.g., duplicate content, obsolete URLs, etc.). Clearly, the site has a duplicate content problem (see the Duplicate Content section for more details), but that only partially explains the inflated index count. These URLs are all currently returning 404 HTTP status codes, and as a result, they should eventually disappear from the index. To expedite this process, Grantland can also explicitly remove the obsolete content from Google’s search results. In this section, I will investigate the characteristics of Grantland’s pages (e.g., URLs, markup, content, etc.) that influence the site’s search engine rankings. Grantland’s URL structure fundamentally changed after the recent redesign. Previously, the site used a much more verbose structure (similar to the one used by ESPN) that added unnecessary directories (e.g., “/story/_/id/”, “/post/_/id/”, etc.) before the actual keywords. Many of the old URLs were also completely omitting keywords (e.g., /blog/the-triangle/post/_/id/61011). The site’s new URL structure is much more streamlined. The Features section is housed under /features/. The Triangle lives under /the-triangle/, and Hollywood Prospectus lives under /hollywood-prospectus/. Plus, the unnecessary directories have been removed, and each URL has at least one keyword. Unfortunately, some of the pages fell through the cracks during the transition to the new URL structure. 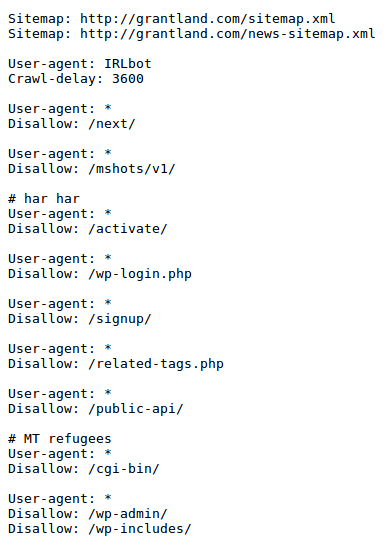 Specifically, while crawling the site, I found 413 unique URLs that return 404 HTTP status codes (i.e., those URLs are no longer accessible). I recommend redirecting these URLs to contextually similar resources (if possible). Also, some of the new URLs do not sufficiently describe the content on their corresponding pages. For example, an article titled, “Chris Paul and the Lakers: What Could Have Been” is found here: http://grantland.com/features/been/ (the only descriptive keyword is “been”). I recommend updating these URLs to make them more descriptive (and more closely aligned with their corresponding content). Another important URL-related consideration is the domain name. Grantland’s domain (grantland.com) is obviously appropriate for the brand; however, ESPN (the domain’s registrant) hasn’t extended the domain’s registration, and now, it’s set to expire on June 11, 2014 (i.e., four months from now). Shockingly, this isn’t the first time the domain has been a problem. ESPN is a multibillion-dollar corporation. They can afford to renew the registration for another 5 years. A site’s HTML markup is extremely important because it contains a few of the most significant on-page ranking factors. When validating Grantland’s HTML, I identified various standards compliance issues. Specifically, most of the site’s pages have 200+ W3C errors and 100+ W3C warnings. Although these aren’t critical issues, I still recommend cleaning up the most common errors (e.g., unescaped characters, missing tag attributes, unmatched tags, etc.) to make the markup more standards compliant. A page’s title is its single most identifying characteristic. The title appears first in the search results, and it is often used to describe the page on social networks. Unfortunately, Grantland’s titles have numerous problems. First, approximately 3% of the site’s titles are duplicates. The worst offender is the “Men in Blazers” podcast, which uses the same title (“Grantland Network Podcast: Men in Blazers «”) on 31 unique pages. Since each of these pages contains a unique podcast episode, I recommend updating each page’s title to describe the topics discussed in that particular episode. This additional information will let users know what to expect from each podcast, and it will give search engines more contextual information about the podcast’s topics. Along the same lines, many of the site’s pages use titles that are not sufficiently descriptive (e.g., “Well Done «”, “On The Road «”, “The Teammates «”, etc.). These titles do not provide enough contextual information about the contents of their corresponding pages. Consequently, users will be less likely to click through to those pages, and search engines will be less likely to rank those pages at the top of their search results. Each page should have unique content and a unique title that effectively summarizes the content for users and search engines. Every title also currently has a trailing ‘«’ character. I recommend removing this extraneous character because it doesn’t serve a purpose, and it makes the titles appear incomplete (i.e., it’s a delimiting character that isn’t actually delimiting anything). Finally, only about 3% of the site’s titles actually incorporate the brand name. To help promote brand awareness, I recommend appending the brand name to the end of the site’s titles (e.g., “The Life and Death of Fandom | Grantland”). A page’s meta description is not explicitly used as a search ranking factor; however, it does directly impact the page’s click-through rate in search results. Each description represents an opportunity to effectively describe a page’s content and compel users to click that page in search results. An automatically generated description wastes that opportunity. For every page on the site, I recommend using a unique meta description that is succinct (no more than 155 characters), relevant for the corresponding page’s content, and not overly optimized. 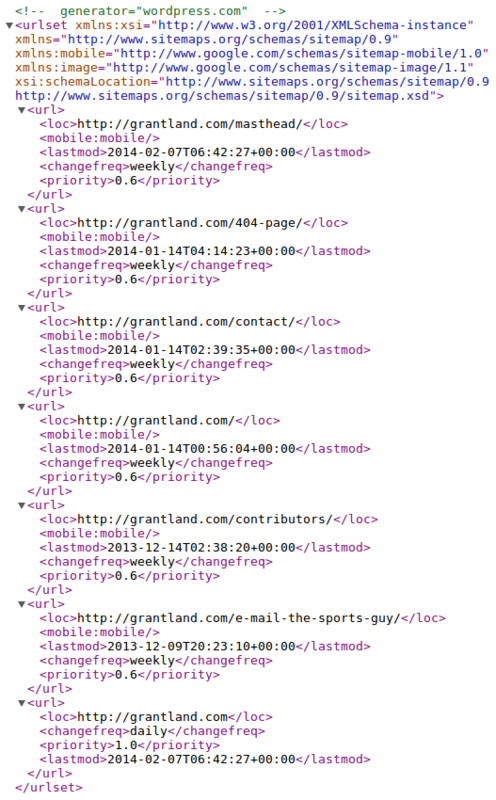 All of Grantland’s pages contain multiple <head> tags that influence the site’s SEO. Every page incorrectly uses rel=”next” and rel=”prev” link elements, which can have serious negative consequences (e.g., incorrectly identifying the pages as part of a paginated series and incorrectly assigning various engagement signals). To avoid these unintended consequences, I recommend removing these elements from every page that doesn’t appear in a paginated series. Each Grantland page also uses a rel=”canonical” link; however, all of these links are self-referential and shouldn’t be a problem. 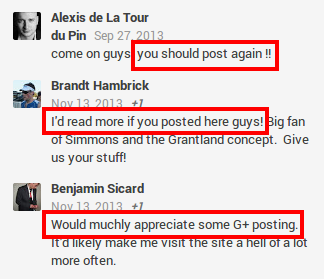 Grantland has a Google+ page, but it’s not directly connected to the site. I recommend explicitly linking the Google+ page and the site by adding a rel=”publisher” link to the homepage. This link will increase the site’s organic search visibility, and it will improve the brand’s credibility. Since Grantland’s pages appear in Google News results, I recommend taking advantage of the standout tag. This tag should only be used for the site’s most newsworthy content and in accordance with Google’s guidelines. All of Grantland’s pages include Open Graph tags, which strongly influence how those pages will appear when they are shared on Facebook. These tags are implemented correctly; however, the “article:author” property consistently contains the wrong information for the site’s articles, and the “article:publisher” property doesn’t use Grantland’s Facebook page. I recommend updating these properties with the correct information to generate more Facebook exposure for the site and the site’s authors. All of Grantland’s pages also include Twitter Card tags, which attach additional information to the Tweets associated with those pages. The site includes the correct tags; however, the “twitter:site” property uses ESPN’s username (“espn”) instead of Grantland’s username (“Grantland33”). Many sites have pages containing structured data, which describes various objects (e.g., people, articles, videos, etc.). Search engines recommend using special markup to identify this structured data and make it more accessible to crawlers. Unfortunately, Grantland does not explicitly define the structured data that appears in the site’s articles. To make these articles more accessible, I recommend implementing schema.org Article markup and using VideoObject markup to highlight videos. Grantland also fails to provide authorship markup for each of the site’s articles, and as a result, Google is not generating rich snippets for those articles in search results. To correct this problem, I recommend creating a Google+ profile for each of the site’s authors (if one does not already exist). Then, I recommend connecting each author’s Google+ profile to the content created by that author. Heading tags are used to create a hierarchical structure within a page’s content. An H1 tag is used to denote the page’s most important heading, and H2 tags are used to denote important subheadings (H3, H4, H5, and H6 tags can also be used to create nested heading structures). The “Simmons” mega menu is using H2 tags for the “Column” labels and H3 tags for the article titles. The usage of these heading tags is incorrect because none of the menu items are associated with the page’s actual content. Similar heading-related issues also exist for the other mega menus (e.g., the “Contributors” menu incorrectly uses 28 H3 tags — one for each contributor). The site’s widgets are also guilty of misusing heading tags. The “More”, “Most Popular”, “Top Stories”, and “Previous Story | Next Story” widgets are all incorrectly using heading tags for labels and article titles. Altogether, each page includes almost 100 heading tags that are completely unrelated to the page’s content, and I recommend removing all of these extraneous tags. Despite all the misused tags, Grantland does use a few heading tags correctly; however, most of them are suboptimal. For example, each article in the Features section correctly surrounds its title with an H1 tag, but it also uses an extraneous H1 tag for the “All Features” label in the widget above the article’s image. I recommend removing this extraneous H1 tag so that each Features page only uses a single H1 tag. Each article in The Triangle and Hollywood Prospectus incorrectly uses an H1 tag for its section header (i.e., the image under the top navigation menu) and an H2 for its title. I recommend removing the incorrect H1 tag for the section header and converting the title’s H2 tag into an H1 tag. For SEO purposes, the two most important image attributes are the image’s filename and the image’s alt text information. Both of these attributes should effectively describe the image’s content to provide additional context for search engines and visually impaired users. Grantland has almost 800,000 image references (i.e., <img> tags), and about 65% of them take advantage of alt text. However, many of the site’s most important images (e.g., the primary images for the site’s articles) don’t have alt text metadata. Of the image references that use alt text, 10% copy a portion of the image’s filename (including punctuation) and use it as the alt text. Since many of the site’s images use irrelevant filenames (e.g., “img_5505-e13891167194781.jpg”, “13133_1366222147-11.jpg”, etc. ), the corresponding image references have irrelevant alt text. For the site’s most important images, I recommend using more descriptive filenames and more relevant alt text information. Grantland’s content should be the site’s biggest strength because many of the articles are described as long-form journalism. However, the site has numerous content-related problems, including duplicate content, in-depth article errors, and usability issues. Duplicate content can be a serious problem because it wastes a site’s crawl budget, and it dilutes the quality and relevance of the site’s unique content. If a site has too much duplicate content, it can also become susceptible to content quality-related search engine updates (e.g., Google’s Panda update). To investigate Grantland’s duplicate content, I clustered the site’s pages based on their similarity to each other. Using this clustering, I found that about 13% of the site’s content is a duplicate (or near-duplicate) of the remaining 87%. That is a lot of duplication so let’s investigate a few of the site’s largest duplicate clusters. 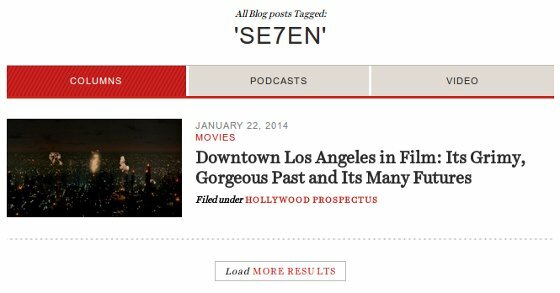 First, the site has thousands of tag-based archive pages that list all of the articles, podcasts, and videos that are associated with a specific tag (e.g., “se7en”). Almost half of these pages have extremely thin content because they only list one or two articles, and as a result, the pages appear to be near-duplicates of each other. To eliminate these near-duplicates, I recommend noindexing these tag-based archive pages (with “noindex, follow” robots meta tags). If Grantland wants to be even more aggressive, they can noindex all of the tag-based archive pages. Another option would be to convert these pages (or a subset of them) into content hubs for the corresponding topics; however, that approach would require significantly more work because the existing format for these pages is generic and not very informational. In addition to the thin tag-based archive pages, the site has hundreds of contributor pages that suffer from the same thin content problem (and should also be noindexed). Most of these thin contributor pages are for guest authors (i.e., authors that do not contribute to the site regularly). The full-time authors tend to have contributor pages that contain slightly more textual content, but those pages have a different duplicate content problem. Specifically, the same content is accessible through two unique URL paths (/grantland_bio/ and /contributors/). To correct this URL-based duplicate content, I recommend redirecting one of the unique URL paths to the other using an HTTP 301 redirect (i.e., redirect the /grantland_bio/ URLs to their corresponding /contributors/ URLs). The next duplicate cluster contains hundreds of podcast-related pages. Similar to the thin tag-based archive pages and the thin contributor pages, these podcast pages only display one or two lines of unique textual content. For these thin podcast pages, I recommend adding more textual content to describe what each podcast is actually about. This additional text will help differentiate each page from the others, and it will give users more information about the topics covered in each podcast. Another large duplicate cluster is full of thin search pages, which display zero search results for a given query. It appears that the site’s old searching system used the following URL structure: /search/_/query/ (followed by the actual search query). The redesigned site uses a different URL structure: /search/ (followed by the actual search query). Consequently, all of the old search URLs (e.g., /search/_/query/humblebrag) are now incorrectly interpreted as searches for queries with a “_/query/” prefix (e.g., “_/query/humblebrag”), and they are generating duplicate content (i.e., the pages with zero results). To make matters worse, the redesigned site also uses a duplicate entry point for search results: /?s= URLs. Now, the same content is accessible through multiple URLs (e.g., /search/humblebrag and /?s=humblebrag). The best way to solve all of these search-related issues is to noindex all of the search-related pages. This approach will address the duplicate entry points, and it will eventually remove hundreds of old search URLs that have already been indexed. Grantland could also use 301 redirects or rel=”canonical” links to explicitly consolidate the search-related entry points. The site could also explicitly remove the /search/ directory to expedite the removal process. Unfortunately, this is just a sample of Grantland’s duplicate content issues. The site also has a number of articles that only have a title (i.e., they’re empty), articles that are accessible through multiple URLs, and articles that have been duplicated on external sites. My recommendations will eliminate a lot of duplicate content problems, but ultimately, Grantland should conduct a comprehensive content audit to identify all of the problems and evaluate the effectiveness of the site’s content assets. Annotate articles with schema.org Article markup. Link the site’s content to Google+ using Google Authorship. Correctly implement rel=”next”/rel=”prev” pagination and canonicalization. Establish a logo for the site using a Google+ company page or schema.org Organization markup. Ensure the site’s content is accessible to Google’s search crawlers. As shown in previous sections, Grantland violates almost all of these guidelines (only the last guideline is implemented properly), which probably explains why the site’s articles were recently removed from Google’s in-depth article listings (see the Organic Search Visibility section for more details). I recommend implementing each of these guidelines to help restore the site’s articles in these listings. Grantland has a few formatting and layout issues that reduce the content’s usability and effectiveness. First, different sections of the site have different layouts, which makes the site feel disjointed. 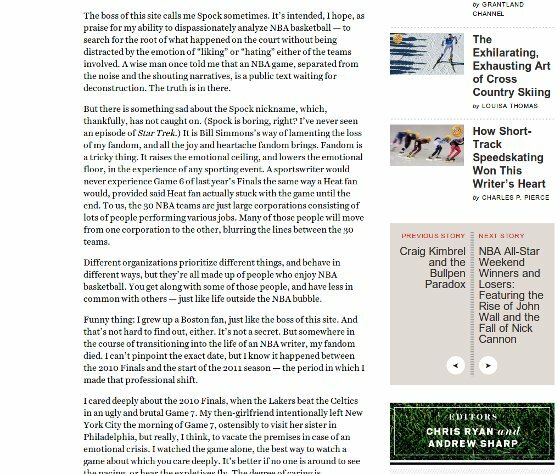 The top of the page has a thin banner ad, followed by the Grantland header, the navigation menu, and The Triangle header. These are all standard elements, and they only take up about 350 pixels, which shouldn’t be a problem. The rest of the page is broken into three columns: left sidebar, center content, and right sidebar. The article’s title takes up the first two columns, and another ad sits in the right sidebar. So far, so good. Next, the article’s tag, date, author, and social sharing buttons are in the left sidebar. An image appears in the center content area, and a “Top Stories” widget sits in the right sidebar. The first observation is that the social sharing buttons are not floating in the left sidebar. I recommend floating these buttons or switching to a two column layout (similar to the Features layout, which I’ll discuss in a moment). Otherwise, these pages will always have a column of whitespace that unnecessarily compresses the center content. Speaking of the center content, I recommend using more formatting (e.g., more headings, more images, more stylistic formatting, etc.) to help break up the text. Long-form content doesn’t have to be a wall of text. Finally, the order of the widgets in the right sidebar is probably suboptimal. I recommend experimenting with the order to find the optimal layout. Specifically, I would push the “Previous Story | Next Story” widget and the “Editors” image to the bottom of the sidebar. Users are more likely to click on a “Popular” story than an arbitrary one (i.e., the story published before or after the current one). Interestingly, for the mobile layout, the social sharing buttons are almost as prominent as the article’s title, and they appear before the article’s image. This isn’t necessarily a problem, but I recommend experimenting with different layouts. Specifically, I would promote the image above everything except the article’s title. By displaying the article’s title and image first, the page will provide more context to users, which should make them more likely to scroll down and actually read the article. 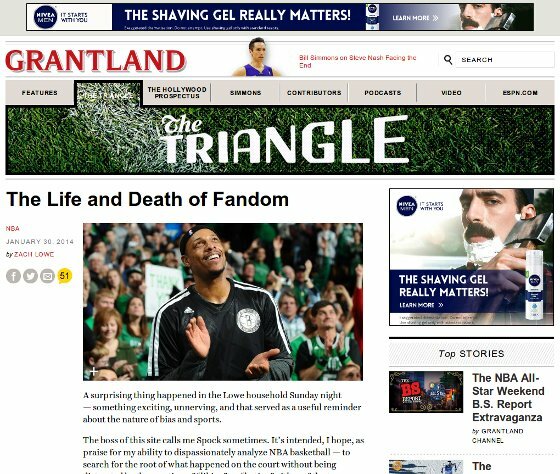 Similar to The Triangle’s pages, the top of this page has a banner ad, the Grantland header, and the navigation menu. However, the page has a “Previous Story | All Features | Next Story” widget instead of a section header. The page also displays a much larger image and a tag above the article’s title. Overall, the page uses almost 700 pixels before it shows the article’s title, which is a bit excessive. I recommend experimenting with different layouts to push the page’s most important content above the fold. One idea would be to convert the “Previous Story | All Features | Next Story” widget into a sidebar widget (similar to one used by The Triangle’s pages). This change would instantly move everything up by about 100 pixels, and it would put more emphasis on the page’s most important elements. Along the same lines, I also recommend moving the article’s tag because its current position pushes the rest of the content down the screen unnecessarily. Another important observation is that this page doesn’t have social sharing buttons at the top (unlike The Triangle’s pages). Sharing buttons appear at the very bottom of the article (right before the author’s byline), but they are very understated. To help bolster social engagement for these pages, I recommend experimenting with different styles and placements for the social sharing buttons. Similar to the desktop version, the mobile version of this page pushes the most important elements to the bottom of the screen. Fortunately, since Grantland uses responsive design, my previous recommendations (e.g., moving the “All Features” widget and the article’s tag) will raise the page’s content across all devices. In this section, I will cover the most important external factors that influence Grantland’s search engine rankings: backlinks and social engagement. I will also investigate Grantland’s YouTube videos because they contribute to the site’s backlink profile and overall social experience. A site’s backlinks represent endorsements from other sites. Therefore, a site’s quality is largely determined by the quality of the sites linking to it. When analyzing a site’s backlink profile, it’s important to evaluate a number of factors, including the quantity of the backlinks, the quality of the linking sites, and the manner in which the backlinks were obtained. 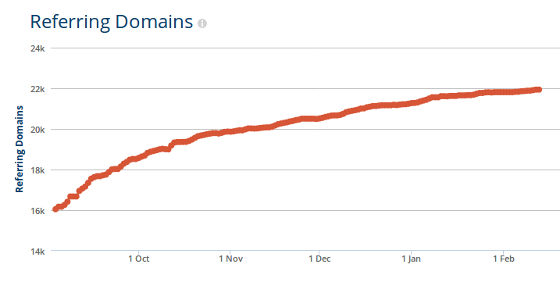 Based on this graph, the site is consistently acquiring new backlinks from unique linking root domains; however, the growth rate for those links was much higher in September than in subsequent months. As this chart shows, Grantland (the blue line) acquired links at a significantly higher rate in 2013 than in 2012; however, these link building improvements were still outpaced by both of the site’s competitors. Almost every month, the competitors acquire more links from more unique referring domains. These acquisition rate differences are particularly noticeable during months with large news events (e.g., February/March 2013 and September 2013), when all three sites covered similar stories. Throughout 2013, Bleacher Report acquired links 5-10 times faster than Grantland (the blue line), while SBNation also acquired links 2-4 times faster. Clearly, Grantland is losing ground to smaller and larger competitors on a monthly basis. This table confirms that Grantland’s backlink counts are lower than the corresponding counts for each of the site’s competitors. The three most popular link monitoring services (Majestic, Ahrefs, and Open Site Explorer) all report that Grantland has fewer backlinks and fewer unique referring domains. However, the table also shows that Grantland’s domain authority metrics are competitive, despite the lower backlink counts. To analyze Grantland’s backlink target distribution (i.e., the distribution of the pages receiving backlinks), I identified the backlink count for each of the site’s pages (using Majestic’s backlink data). Unfortunately, since the redesigned site uses a new URL structure, most of the backlink targets are split between the old and new versions of the site’s URLs. To correct these inconsistencies, I crawled the old backlink targets and created a comprehensive URL mapping (based on redirections) for the old and new URLs, and then, I used that mapping to consolidate the data. The graph displays a standard Zipfian distribution. 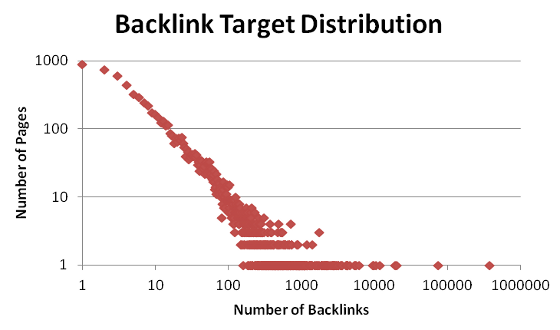 On one extreme, 44% of the site’s pages have 0 backlinks (not displayed, due to the log scale), and 71% of the pages have less than 10 backlinks. On the other extreme, the homepage has more than 380,000 backlinks, which is a third of the site’s total, and 0.1% of the pages receive 50% of the links. The backlink count for the homepage (http://grantland.com) is particularly important because it is heavily skewed in favor of the old URL (http://www.grantland.com). Specifically, the old URL receives an order of magnitude more links than the new one (346,524 vs. 34,792) and 4.3 times as many unique referring domains (2,901 vs. 673). 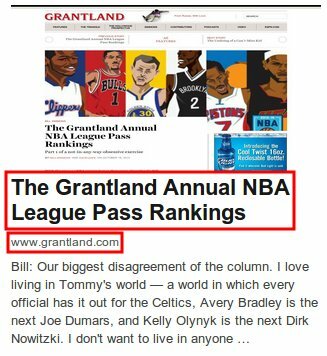 I recommend reverting back to the site’s old canonical domain (www.grantland.com) to avoid unnecessarily diluting the external authority associated with 346,524 backlinks and 2,901 referring domains. While crawling the site’s old URLs, I also discovered 1,442 Grantland URLs that currently return a 404 HTTP status code (i.e., they are no longer accessible on the site). All of these URLs receive at least one external backlink so I recommend redirecting them to contextually similar pages on the site (to avoid unnecessarily losing external authority). This graph displays a Zipfian distribution that is similar to one shown above. 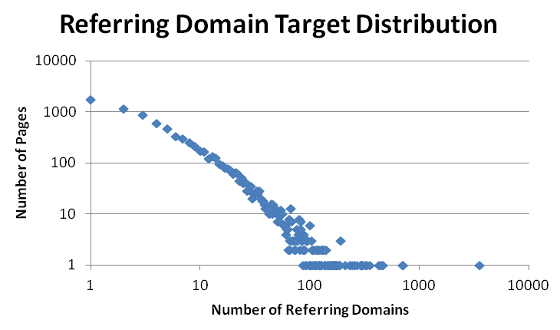 85% of the pages receive links from fewer than 10 unique referring domains, and only about 0.5% of the pages have links from more than 100 referring domains. Obviously, a few of the site’s pages are acquiring backlinks very effectively, while the remaining pages are struggling. To help understand this dichotomy, I manually investigated the top 100 pages (in terms of links from unique referring domains) and identified a few distinguishing characteristics. Most notably, 85% of the pages are articles found in the Features section. These articles contain more textual content, and they provide more comprehensive coverage for their subject matter. Also, many of these articles tackle controversial topics (e.g., PED usage in sports, bullying, etc. ), or they add a unique perspective to a culturally significant event (e.g., oral histories of the Malice at the Palace, the 2003 World Series of Poker, and Swingers). These longer, more in-depth articles obviously require more time and energy to produce, but they are also the site’s most valuable linkable assets. Moving forward, I recommend dedicating even more resources to these articles and spending more time on outreach to expose the content to a larger audience. The site has a few extremely high-quality backlinks (the top right points on the graph) from highly authoritative sites such as Bleacher Report, ESPN, and The Guardian. However, most of the site’s backlinks are on the other end of the spectrum (the dark sections at the bottom left area of the graph). 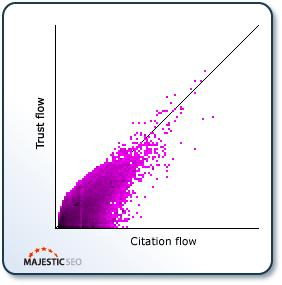 Specifically, 71% of the links have a Citation Flow value of 0, and 84% of the links have a Trust Flow value of 0. None of the links I investigated fall into the suspicious categories that are commonly associated with Google’s Penguin update (e.g., low-quality directory links, comment spam, forum spam, article marketing links, advertorials, etc. ), and none of the links use over-optimized anchor text. In addition to low authority links, Grantland also receives a significant number of sitewides (i.e., links that appear on every page for a given referring domain). Almost all of these domains are sending sitewide links to Grantland; however, the links are safe because they use innocuous anchor text. Specifically, most of the domains use branded (e.g., “grantland”) or generic (e.g., “more”) anchor text. Two of the domains (mischeathen.com and baseballcrank.com) use more optimized anchor text, but it always corresponds to the target page’s title. None of the links associated with these domains should pose a problem for Grantland. Another important characteristic of Grantland’s backlink profile is the anchor text distribution. Ideally, the site’s backlinks will be using relevant anchor text that is not overly optimized for specific keyword phrases. Branded – This anchor text focuses on the site’s brand-related keywords (e.g., “grantland”). Naked – This anchor text uses one of the site’s URLs (e.g., “www.grantland.com”); this is commonly referred to as a naked link. Blank – This category covers links that do not use anchor text (e.g., image links). Money – This anchor text uses a money keyword (e.g., “kobe bryant”). Generic – This anchor text is not relevant to any specific site (e.g., “more”). 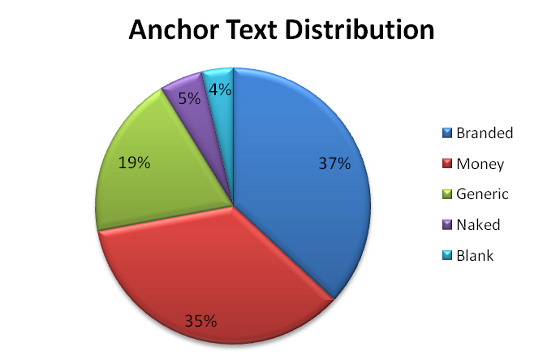 56% of the site’s backlinks use branded or generic anchor text, and 35% of the links use money keywords. At first glance, this appears to be a high percentage of optimized anchor text. However, the optimized anchor text is distributed across thousands of unique phrases, and almost all of the phrases correspond to a target page’s title. For example, the most frequently occurring anchor text phrase in this category (“The Economic Case Against The DH (Grantland 7/12/11)”) is used in less than 1% of the site’s backlinks. As a result, Grantland’s anchor text distribution appears to be completely natural. Overall, Grantland’s backlink profile appears to be clean. I didn’t find any suspicious or unnatural links that warrant additional attention, and the site’s anchor text distribution is very natural. Since I didn’t identify any link-related warning signs during my sampled analysis, a full link audit is unnecessary at this time. A bigger concern is the site’s inability to acquire links as quickly as its competitors. In the short term, Grantland can try to bridge this gap through link reclamation efforts (e.g., claiming unlinked brand mentions, correcting broken links to the site, etc.). Longer term, I recommend dedicating even more resources to the site’s in-depth articles because they are responsible for most of the links (85% of the top 100 articles appear in the Features section). Also, I recommend performing targeted outreach to help expose the site’s content to more authoritative influencers. Finally, Grantland’s canonical domain recently changed from www.grantland.com to grantland.com, and as a result, the site is now unnecessarily diluting the authority of 346,524 backlinks (and that’s just for the homepage). To correct this problem, I recommend reverting back to the old canonical domain. In the social Web, a site’s success is determined by its ability to generate social engagement. This engagement has two important components: community engagement (i.e., creating a vibrant social community and actively participating in a social dialogue with that community) and content engagement (i.e., creating and promoting content that truly resonates with the social community). Grantland has established a large social community on Facebook, Twitter, and Google+. The site’s Facebook page has almost 200,000 Likes, and the site’s Twitter account has more than 300,000 followers. Also, nearly 50,000 people have followed the site’s Google+ page. Specifically, all of the page’s updates share a link, and they rarely include calls to action or questions that encourage community participation. Many of the updates are also timed poorly, and they don’t take advantage of hashtags. 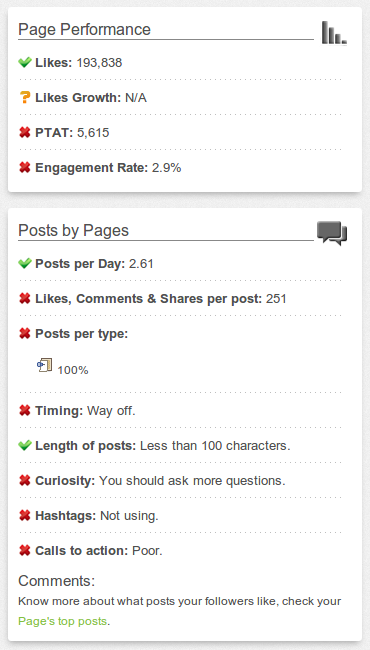 Consequently, Grantland’s Facebook page has an engagement rate of only 2.9%. The site’s Twitter account has similar problems. The account is updated regularly, and it has a high Social Authority value (75); however, the account’s engagement with the community is extremely low. 95% of the site’s Tweets include a link, and only 1% of the Tweets directly engage followers (through Retweets and @replies). Basically, Grantland’s Twitter account is just an RSS feed. These charts suggest that Grantland’s Twitter account is completely inactive during the most active hours for Grantland’s followers (i.e., after 7p ET), and as a result, the site is missing a valuable opportunity to engage with its Twitter community. Clearly, Grantland’s Facebook page and Twitter account have areas for improvement, but the site’s Google+ page has much bigger problems. Most notably, the page only has 2 posts: one from March 13, 2012 and another from November 13, 2013. Based on this feedback from real users, Grantland could immediately generate more referral traffic simply by posting more regularly on Google+. 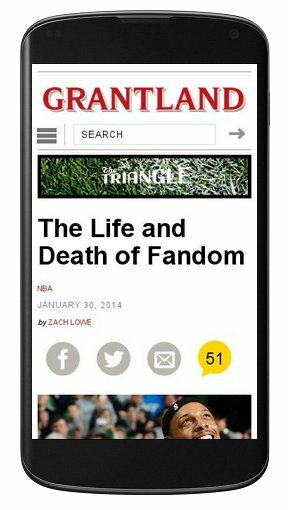 Also, the content shared through Google+ would influence the search results for Grantland’s followers, which would generate additional search traffic. For all three of these communities, I recommend experimenting with different post types (e.g., images, videos, etc.) and different posting schedules to identify what resonates with each’s community’s members. I also recommend actively engaging community members by asking questions and participating in social conversations. The most important observation about this graph is that many of the pages have very little social engagement. 97% of the pages have fewer than 10 +1s, but this is somewhat expected, given the site’s infrequent interaction with the Google+ community (and the lack of +1 buttons on most of the site’s content). The Facebook and Twitter results are much more surprising: 69% of the pages have 0 Facebook Shares, and 67% of the pages have 0 Tweets. Some of these low values could be byproducts of the site’s new URL structure (i.e., the old value didn’t carry over to the new URL), but these results still represent a low level of social engagement for a large percentage of the site’s pages. Another interesting observation is that the Facebook and Twitter plots are extremely similar, which means many of the pages have a similar level of engagement in both communities. 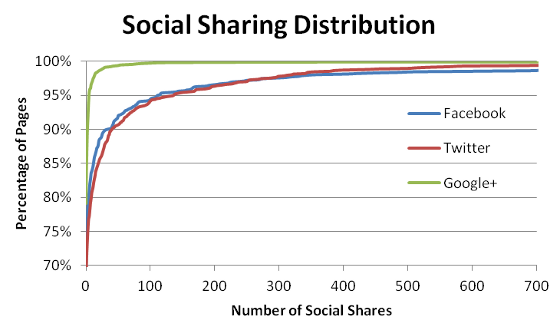 However, despite these similarities, the best performing pages are consistently shared more frequently on Facebook. At the bottom of articles in The Triangle and Hollywood Prospectus, the Facebook Recommend button is the only sharing option. To improve the content’s social engagement in Facebook, Twitter, and Google+, I recommend using more prominent social sharing buttons that are emphasized equally. I also recommend showing the corresponding share counts for each community to provide social proof, which will motivate more users to share the site’s content. Finally, I recommend pre-populating the social sharing buttons with more than just the page’s URL. For example, an article could populate the buttons with its title or an appropriate description (in addition to the URL). When the pre-populated information is blank (or only includes a URL), users are much less likely to actually share the content. Grantland has produced 566 videos, and they’re all hosted externally on the Grantland YouTube channel. The site sacrifices SEO benefits (e.g., video snippets, backlinks, etc.) by hosting these videos externally; however, the videos are increasing Grantland’s brand exposure and the site’s audience. Specifically, Grantland has successfully acquired more than 276,000 YouTube subscribers and more than 45 million total video views. Despite these encouraging signs of user engagement, the site’s videos could be improved significantly by following a few best practices for YouTube optimization (e.g., relevant titles, appropriate tags, manual transcription, etc.). Grantland’s most successful YouTube videos all have one thing in common: a compelling and relevant title. Unfortunately, many of the site’s videos use titles that only include brand-related phrases (e.g., “Jalen Rose Report 1/28/14 | Grantland Channel”). These generic titles make it difficult for non-subscribers (i.e., users that don’t know anything about the site or its podcasts) to find and watch the corresponding videos. Every video’s title should include relevant keywords that describe the video’s content and compel users to click the title in search results. I recommend making the generic titles more specific (e.g., “Jalen Rose Rages Against Sleeves in the NBA | Jalen Rose Report 1/28/14”). I also recommend using the video’s title (or at least a few relevant keywords) in the video’s filename (e.g., “jalen-rose-rages-against-nba-sleeves.mov”). The first few sentences of a video’s description should be the most compelling because they are the only lines that will appear in search results. However, the description can use up to 5,000 characters to effectively describe a video’s content. I recommend expanding these descriptions to provide more context about each of the topics discussed in the videos. Since many of the videos are more than 30 minutes long, a few sentences do not sufficiently describe the content to search engines or users. For each of the longer videos, I also recommend creating a table of contents in the description using time codes. Specifically, time codes could be used to highlight the most important moments in a video, and then, additional text could summarize the topics covered around those moments. All of Grantland’s videos take advantage of YouTube tags; however, most of the videos appear to use the same collection of more than 20 tags. This is an excessive number of tags, and many of them are not relevant (e.g., NFL-related tags for NBA-related content, movie-related tags for sports-related content, etc.). I recommend using more video-specific tags and fewer generic channel-specific tags. For example, a recent video about Steve Nash’s return to the Lakers doesn’t include any of the most relevant tags (e.g., “Steve Nash”, “Lakers”, etc.). Transcripts offer a number of optimization and usability benefits. First, YouTube indexes a video’s transcript and uses its contents to determine the topical focus of the video’s content. Therefore, transcripts represent an opportunity to tell YouTube exactly what a video contains. Transcription also generates closed captions for a video, which allows hearing impaired users to watch the video and follow along with its dialogue. Unfortunately, all of Grantland’s videos appear to rely on YouTube’s automatic transcription. This approach doesn’t offer any index-related benefits, and the accuracy of automatic transcription is typically very poor, which means the closed captions are frequently incorrect. I recommend creating and uploading transcripts to improve the searchability and usability of the site’s videos on YouTube. 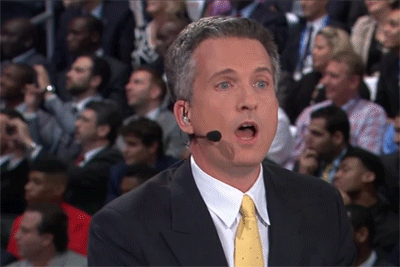 If you read everything in this audit example, Bill Simmons and I are both truly impressed. If you cheated and jumped straight down to this section, I’ll forgive you, but Bill probably won’t. Either way, this section contains a summary of my most important observations and recommendations for Grantland’s accessibility, on-page ranking factors, and off-page ranking factors. Search engines are not restricted by Grantland’s robots.txt file or robots meta tags; however, the site’s accessibility has room for improvement. Grantland has a few encouraging on-page signals, but overall, the site’s on-page SEO needs a lot of work. 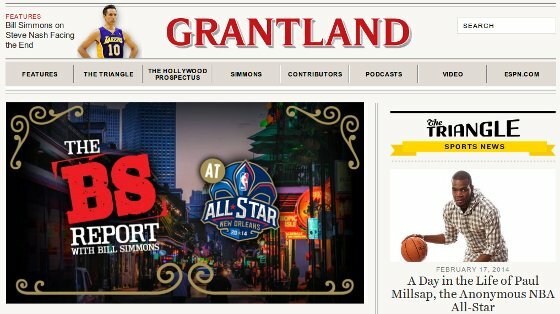 Grantland has acquired a significant number of backlinks, and the site has established large social communities on Facebook, Twitter, and Google+. However, the site still has a number of issues that reduce its overall off-page optimization. I would love to hear your thoughts, suggestions, and questions in the comments below. Do you have any audit-related tips you’d like to share? How would you fix Grantland’s SEO? Wow Steve! As someone who’s done probably hundred’s of audits, the time, energy and depth which you’ve put into this example is crazy. You’ve easily given Grantland thousands of dollars in value here – very impressed and they should obviously hire you. I’m really glad you enjoyed the post, and I agree: there are a TON of SEO wins in here for Grantland. Is it just a co-incidence in your opinion that the spike in visibility happens around the time NFL training camps opened and the drop comes at the end of the NFL season, after the Super Bowl? That’s an excellent observation. However, when you look at the keywords that actually drove the visibility increase in August, they were mostly in-depth article keywords (i.e., keywords that triggered in-depth article listings). Some of those keywords were NFL-related (e.g., “tim tebow”), but most of them were not (e.g., “lebron james”, “cricket”, etc.). Also, when you look at the site’s historical organic search visibility, you don’t see a similar pattern in previous years. Specifically, the site’s visibility was relatively flat during the previous NFL season. Finally, even if the visibility changes aren’t attributed to in-depth article listings, the site still has numerous SEO issues (as I’ve itemized in the post). Moving forward, those issues represent a serious opportunity for Grantland to improve the site’s overall optimization. You’re right. Makes me wonder whether their existing SEO people went with the NFL ‘explanation’ though! Honestly, I’d be shocked if they have “existing SEO people.” There are just too many SEO 101 mistakes. If I could slow clap in a blog comment I would. Hahaha… I’ve never received a slow clap so that just made my day. And it really is amazing how many big brands completely ignore SEO basics simply because they think they’re “too big to fail.” Grantland is leaving so much money on the table right now, and most of these problems are EASY to correct. Thanks for the comment Jeremy! 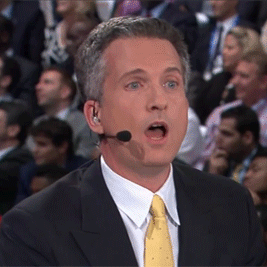 You deserve a personal “thanks!” from Bill Simmons for this one. If you don’t get that, you’ll get one from me. I learned a lot from this. Thanks Steve. I’m also a big Simmons/Grantland fan and often thought their SEO could use some brushing up. Little did I know there were THAT many opportunities for them. Again, awesome work on this! Thanks for the “thanks!” Brian. 😉 Even if I don’t get one from Simmons, yours is much appreciated. ESPN/Grantland are both great examples of big brands that are leaving a TON of money on the table because they completely ignore SEO. Most smaller sites are struggling to create linkable assets. These big guys have all kinds of assets… but they’re misfiring on even the most basic SEO principles. Much applause from me as well! Thank you Steve. I was curious what tool you may have used to determine Authority Flow? Thanks for the comment Emory. I determined the site’s Authority Flow using my own code, but my process is very similar to the one Moz uses to create their Page/Domain Authority metrics and the one Majestic uses to create their Citation Flow values. However, the Moz/Majestic metrics are primarily measuring external authority… whereas in that section, I was only looking at the site’s internal authority flow. Well done. I’m truly impressed, and I hope Bill takes the ball you’ve just passed him and runs with it. It’s a slam dunk! Thanks Stephen! I also hope Bill and the Grantland team puts this to good use. They have a TON of strong assets on the site; they just need to make some SEO corrections to maximize the value of those assets. And thanks for using a basketball metaphor… that got me really excited about the next few months of NBA/college ball! It’s not the first of your posts that goes straight to Instapaper to digest-study it calmly later. Thanks for your transparency and the work put together in this piece. As for transparency, it’s the only way to go. The community will never progress if we don’t learn from each other. “Of the site’s 10 most authoritative pages, 7 are found directly in the header’s top navigation menu, and the other 3 are found in one of the header’s mega menus. I’ve read it multiple times and was wondering what you’d propose? Thanks for the comment Eli. In the section you’re referencing, I gave two recommendations: (1) reorganize the navigation structure and (2) create more cross-page linking opportunities. One of the site’s fundamental problems is that it doesn’t properly distribute links throughout the site architecture (you can visualize it as an extremely unbalanced tree). But the issue isn’t that the site has pages in the navigation menu; it’s that those page are essentially the ONLY ones receiving internal authority. (With that said, there are also pages that have no business receiving sitewide links — e.g., /masthead/). Would you mind sharing the different tools you used to create this report? For the most part, I disclosed (and linked to) every tool (and data set) I used. Most of the analysis was done manually or with the assistance of code I’ve written myself. Specifically, all of the duplicate content and backlink analysis results were created using my proprietary tools (most of the actual backlink data was collected from Majestic). For the social engagement analysis, I used LikeAlyzer, Followerwonk, and Social Crawlytics… plus more of my own tools. Hi Steve, great post. Any chance you have a timeframe associated with this process? An audit this size typically takes me about 2 weeks, depending on how many audits I’m working on concurrently. I don’t know how long this post actually took to complete because I worked on it in pieces (my real audits took precedence and slowed down the process). Thanks for the comment (UK) Steve! This was one of the best audits I’ve read in a very, very long time. Thanks for sharing it and yeah, lets hope Grantland appreciates your work :)! I just hope Grantland implements some of these recommendations. I’ve been a Simmons fan for over a decade, and it actually pains me to see the site under-performing. Especially when it has a lot of quality content that should be killing the competition. How did did you find the real page rank for the “Authority Flow” analysis? Did you pull the list of pages from the OSE Top Pages report? Thanks for the comment Danny. To clarify, it’s not the real PageRank (i.e., the authority Google assigns to each of the pages). It’s a PageRank-based notion of authority that I generated based on the site’s internal link graph. The Top Pages reported by OSE are based on a similar approach; however, those pages are ordered based on external authority (using Moz’s index). I would need to know more about Grantland’s development/publication process to truly give an appropriate prioritization of tasks; however, the reclamation items should absolutely be at the very top. Right now, the site is unnecessarily diluting almost half a million external links. That needs to be corrected immediately. Forgot to ask – why no video sitemap recommendation? Because their entire video strategy is YouTube-based. It wouldn’t hurt to use a Video Sitemap with the YouTube videos, but it’s unlikely that the site will ever generate a video snippet for one of those videos. Now, if the site ever decided to host their own videos or use a third-party solution (e.g., Wistia), a Video Sitemap would be critically important. This is fantastic. 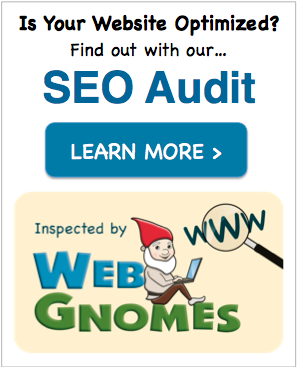 Great, great example of an audit for a site that could really benefit from some SEO attention. I remember reading in a Simmons column at one point a jab at bleacher report for “rigging their headlines for traffic.” Presumably he meant page titles and some sort of perceived “B.S. SEO.” I wonder if they haven’t embraced SEO because of the assumption that it’s all “rigging headlines” and lowering quality standards. You pretty clearly outline tons of quality strategy, so again, fantastic work. If I’m not mistaken, one of Grantland’s original missions was to fight the Deadspin/Bleacher Report model of link bait fueled sports journalism. (There’s actually a great old post on Deadspin about how the Bleacher Report “sausage” is made.) So philosophically, that might cause them to mischaracterize SEO. But as you said, the site’s SEO problems extend well beyond just catchy titles. It’s absolutely possible to maintain a high level of journalistic integrity… while also maximizing organic search visibility. And nothing in this audit would require a shift in the site’s core principles. I like the format, it’s basically what I deliver in my technical audits, just that after all the key takeaways I also add a table with 4 columns: Priority, Description/Issue, Level of Effort, and Impact. With this, whoever is taking care of fixes and implementation can create a QA log to follow up on. Optionally, you can add a fifth column for comments to allow for comments on each task. Thanks William! And you’re spot on about the importance of summarizing and prioritizing an audit’s findings. If a client can’t pick up an audit report and immediately know what to do with it, the audit’s results are functionally worthless. Awesome job on this Steve, very thorough. 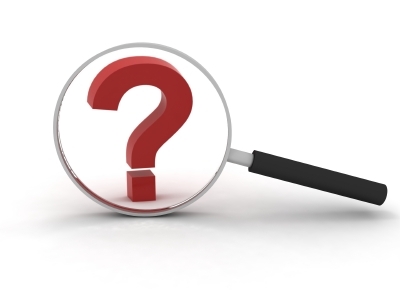 Can you speak to what “SEO Visibility” is actually measuring? Kind of a vague term, and SearchMetrics doesn’t break it down on their site. I’m guessing it’s some kind of ‘# of indexed pages metric’ maybe? Thanks for the comment Nate! 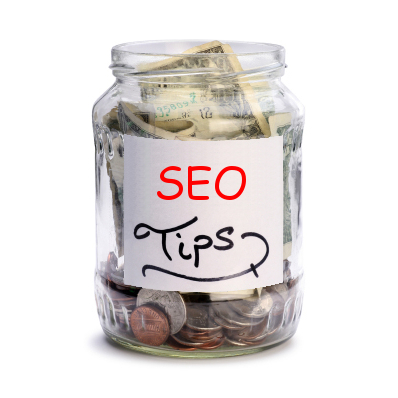 SEO Visibility is an approximation of the organic search traffic that a site is receiving. If you dig into the keyword data presented by Searchmetrics, you’ll see two fields: Search Volume and Traffic Index. Search Volume is an estimate of how many times a given keyword is searched, and Traffic Index is an estimate of how many of those searches result in a click for the website in question. When you add up the Traffic Index values for a site’s keywords, you get the site’s SEO Visibility. SEMRush also provides visibility-related metrics, but Searchmetrics consistently provides more accurate estimates (and they’re more granular). Wow, what a great site audit! It inspired me to go dig into my own sites for a bit and fix some inefficiencies. That’s the beauty of this industry… there’s always something that can be improved! Hi Steve, I just wanted to say fantastic job. The work that was put into creating this article must have been so much greater than the time it took to write it up, but that’s what has made it such a credible piece and a great read. Thanks Steve! Funny enough, it probably took me longer to write the post than it did to do the actual analysis. Another wow here! I’m only 1/2 way through but so far it’s been really interesting and useful – even picked up a couple of tips for my next audit. Will return to finish later. Somebody owes you a beer – or a gig! Grantland don’t know how lucky they are. However, I know how lucky I am to have this to refer to. Great effort and thanks for sharing. Ah hahaha… I like how everyone from the UK is now self-designating themselves. UK Steve is a trend setter! Regardless, I genuinely appreciate your kind words, and I hope this post continues to be a valuable resource for you. Thanks for the comment Daryl! Thanks again Steve. Can’t wait for the next one!! Bookmarked for full read, impressive depth here for sure. One hail mary question: Does seasonality have a hidden impact here? Sadly, for most sports websites, there is Fantasy Football season and everything else, and secondly NFL football season and everything else. Does the data account for the loss of traffic as people’s fantasy football teams fell out of contention? For the end of the NFL season which was very close to 1/31. Thanks for the comment Trey. As I mentioned in an earlier comment, most of the keywords driving the visibility increase in August were not NFL-related. Also, the same visibility patterns do not appear in previous years. In fact, the site’s visibility was relatively flat during the previous NFL season. Regardless, this is all a moot point because even if the site’s visibility was consistently increasing, all of my recommendations would remain the same. The site is not reaching its full potential due to fundamental SEO issues, and that’s the most important observation from this audit. Awesome in depth article thanks heaps. Thanks also for linking to the tools you used. Thanks Andrew. I’m really glad you like the post. 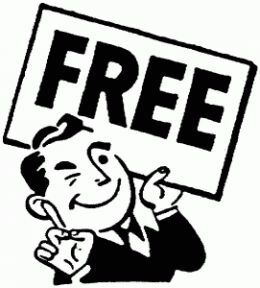 For even more tools, you can check out this list of free SEO tools and this list of SEO analysis tools. Great post here Steve – I’m an avid Grantland reader too so it was sort of doubly interesting from that angle :). The information architecture / internal linking issues are something I see a lot of publishers struggling with – things like traditional categories and date based archives are less popular now I think with a lot of sites going to more visual magazine style content (and pushing redundant recent content menus like you mentioned here) so getting that so solid / metrics based related pages plugins seem like a pretty common opportunity. I wouldn’t limit your observation to just publishers. Most sites have some sort of IA or internal linking inefficiency. E-commerce sites are notorious for these types of issues, and the problems are magnified by the large page counts typically associated with those sites. I mentioned adding more content to the podcast landing pages (in the Duplicate Content section), and you’re absolutely right: transcription is a great way to accomplish that goal. Leveraging partnerships is definitely an option, but honestly, I’d like to see the site become less dependent on ESPN. I don’t know what percentage of their visits are coming from the links on ESPN’s homepage, but I’m sure it’s a big number. Those links are obviously great, but I also view them as a crutch. In fact, I imagine many of these SEO-related issues have gone unnoticed because the ESPN-related traffic creates a false sense of accomplishment for each new post. Now, I’m not suggesting they remove those links. I would just like to see them adopt a much more diversified strategy for promoting the content and getting it in front of influencers. Thanks for sharing your thoughts; I really appreciate it! Anyway thanks for responding and again nice work on this! Thanks Tom… I definitely agree that they could be targeting reddit far more effectively. I’m learning a ton here. Thanks for the great work. 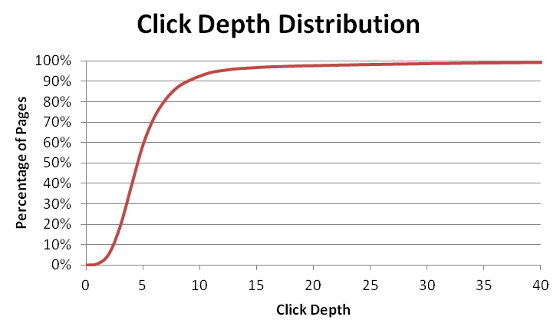 How did you create the click depth distribution? Very interested in this section. Thanks Griffin… I’m glad the post is helpful. You can identify each page’s click depth at least two different ways. You can track it while performing a crawl, or you can calculate it using a shortest path algorithm on the internal link graph. Thanks for the great read, Steve. I’m doing a bit more research on this now, but wonder your insight. You had mentioned, “A site’s HTML markup is extremely important because it contains a few of the most significant on-page ranking factors.” You immediately follow with W3C compliance and recommendations. The question: How significant are markup issues? Here’s a fun scenario, probably not so much with high SEO impact, but may be potentially. In a recent project, I’ve been breaking apart the CSS to speed up the website, even taking Ilya Grigorik’s (Google’s Web Performance Engineer) advice to load above-the-fold inline and later load the rest of the CSS. In HTML5, the link attribute should only reside within the element and will throw an error if loaded just before the . Probably not serious, just looking for your thoughts, thanks. Thanks Joe… I’m really glad you enjoyed the post. W3C compliance is not a high priority, and most pages will have at least a few errors and warnings. Ideally, you just want to avoid situations where your pages are generating hundreds (or thousands) of errors/warnings. Also, it’s important to recognize that not all errors are equal — some standards violations are much more egregious than others (so even if you have hundreds of errors, they still might have a very limited impact). Really nice work, the length of the article shows how much effort you’ve put in and its great to have an article with a real example which is unlike most of the articles in which people just talk in a broad way like “10 ways to do this or that”. Your post also shows the importance of an audit on any project. I have seen people often jump to link building without even having an audit. Again thanks for sharing such a wonderful article. Thank you for those kind words Amit! I completely agree with you — an SEO audit is extremely valuable for every project, and unfortunately, it gets overlooked far too often. What tool(s) did you use to generate the info/graphics for the “community engagement” section, specifically about the Facebook performance? I covered the tools I used in this comment (LikeAlyzer was one of the Facebook-specific tools). This is an amazing example and i’ll definitely be referring to it in the future. The internal link authority analysis was particularly interesting and is a topic i’ll be looking into more in the future. I’m curious as to your thoughts on this. The website has a ton of 404’ing pages. Do you think having a custom 404 page that random generates links to important pages (news articles etc) will help reserve the crawl budget whilst helping to increase the indexability of the important pages? Not even sure if this works properly, I believe this was a tactic by Neil Patel used on Tech Crunch. Any thoughts would be greatly appreciated! A custom 404 page is a great idea because it helps soften the blow for users (i.e., it improves the site’s user experience). Instead of being confronted with a very unfriendly error page, users receive a succinct explanation of what happened as well as helpful links to guide them to an appropriate destination. However, a custom 404 page won’t solve the underlying crawl budget issues. When a crawler encounters a 404 HTTP status code, it’s essentially a dead end. Even if authority was passed through the links on a custom 404 page (which is unlikely), that authority would still be dampened. The solution for internal authority leakage is completely eliminating broken internal links. Thanks for the great post. Can you shed some light on what tool you used for ‘Community Engagement’ stats? Thanks in advance! Thanks Terry… I’m glad you enjoyed it! I gave more tool-specific information in a previous comment. This is an awesome article to learn how we should audit an website thoroughly. The points and aspects you have shown here are really mindblowing and it will take enough time for me to intake all of these. Actually I learnt so many things and I am glad there are so many left here to learn. Thanks for sharing your work, effort and experience.